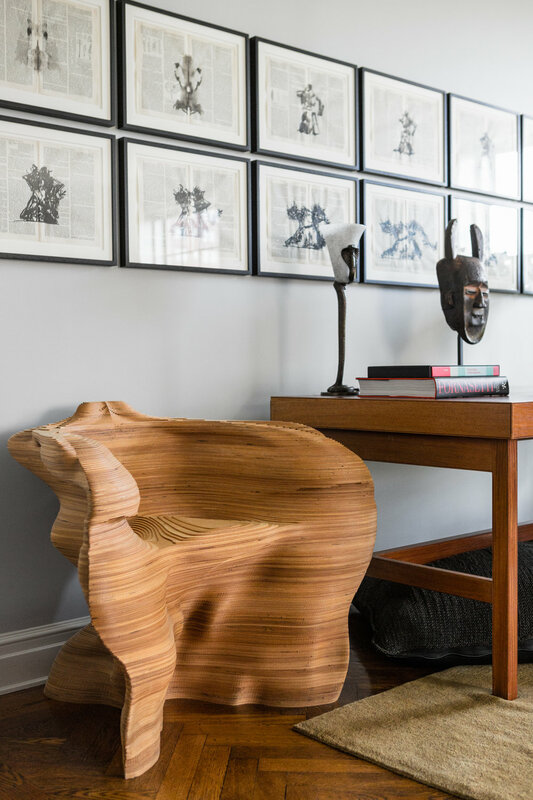 This Manhattan family loves art and design and wanted a big place to enjoy it and share it with friends. And nothing could give us more pleasure than setting the stage for clients to express their own personal taste and curious minds. This room could belong to no one else. It's a generously proportioned drawing room with broad and handsome steel windows opening on to river views. We dispensed with all but the most minimal window treatments, and we gave them just what they needed: maximum wall space for the expanding, contemporary art collections, ample seating, and plenty of horizontal surfaces for the display of whatever is inspiring them at the moment - whether it’s art deco bronze lighting, African sculpture, or Scandinavian ceramics. We have an outstanding collection of vintage chairs in this room, including these shearling covered chairs, called the Clam, designed by the mid-century Danish architect, Philip Arctander. And the exuberant pair of wing chairs by the Italian, Carlo Mollino. If you're really adventurous, there is the Slice Armchair by Matthias Bengtsson from 1999. All photos by photographer Andrew Frasz.